Trading and Outsource Manufacturing of Industrial Safety Items. 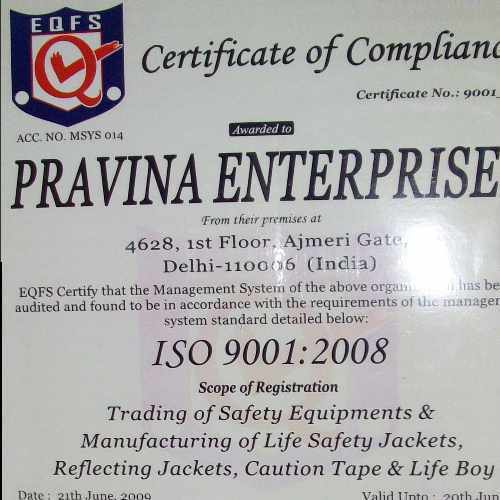 Incorporated in 1990, at New Delhi, the capital of India, we, “Pravina Enterprises,” are one of the leading manufacturers, exporters and suppliers of premium quality Industrial Safety Wears, Safety Equipment and Industrial Safety Products. Our wide portfolio encompasses Safety Jackets/Harnesses, Studs, Chevrons, Delineators, Safety Shoes, Glow/Safety Signs, Overhead Sign Boards, Safety Gloves, Safety Goggles, Industrial Safety Helmets, Disposable Earplugs, Safety Belts, Respirator Masks, and other products. By leveraging our wealth of expertise and experience, we also customised these products in terms of design, material of construction and dimensions. We also offer OEM services and manufacture these products for others to repackage and sell. The company is professionally managed by experienced managers who possess rich industrial knowledge in the discipline of industrial safety products. Their expertise and experience have helped us to carve a special niche for ourselves in today's highly competitive business scenario. Further, their transparent dealings and sound strategies have helped us to build a strong market base in domestic as well as in the markets of Middle East, East Asian countries and many other regions of the world. Our company is well equipped with the state-of-the-art infrastructure that is furnished with cutting edge technologies and machines. To ensure smooth and uninterrupted functioning, we have segregated our whole unit into different departments like Production Unit, Quality Control Unit, R&D Unit and Warehousing & Packaging Unit. Powered with sound infrastructural abilities and well trained manpower, we manufacture, export and supply Industrial Safety Wears, Safety Equipment and Industrial Safety Products to provide a safe and healthy environment to your company. Fabricated following stringent quality control measures and utilising the best grades of raw material, our products are acknowledged for their sturdy construction, light weight and reliable performance. We are well supported by a strong team of qualified and experienced personnel who possess in-depth understanding in their respective domain and of associated technicalities involved in the process. Their versatile knowledge enables us to execute every task with utmost efficiency, thus minimising every possibility for any flaw from their end. Our production engineers are adept with the sophisticated technologies involved and try their best to develop an unbeatable line of products that is high on every aspect of reliability and safety.